Vacation Villas #633 presents you with an unforgettable setting from the top floor! Located in the northernmost residential building on the island, this newly remodeled condo offers a spacious lanai where you will become captivated by the panoramic views of the beach and its breathtaking sunsets. From the superior upgrades to the exquisite decor, this 2-bedroom, 2-bathroom condo has every amenity needed for an extended stay or a short getaway! The fully equipped kitchen will be sure to cater to your every need! Accommodating up to 6 guests, the master bedroom is furnished with a king size bed, while the guest bedroom offers two twin size beds and the living area is equipped with a sleeper sofa!! 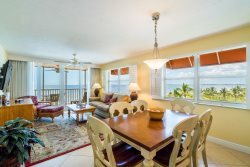 Located on pristine shore of Fort Myers Beach, Vacation Villas #633 is the perfect place for a relaxing escape! Once you park in your assigned spot and step out of your vehicle, you will be greeted by the lingering salty air and the waves dancing along the 7-mile stretch of the sugar-sand beach! You are conveniently located next to Bowditch Point nature preserve, where you will find walking trails and wildlife! You can even soak up the sun at the beachfront heated pool or cook your favorite dish at the BBQ area! With just a short walk or a quick tram ride, you will be sure to enjoy lively downtown Times Square, where you will find many local shops and restaurants as well as the famous pier!